This is the third that I’ve read in the Object Lessons series (Sock, Souvenir). Kinney examines the hood’s sinister appearances in history: worn by executioners, torturers, and (not by choice) their victims; worn by the Ku Klux Klan; given as an excuse for the murder of Trayvon Martin. 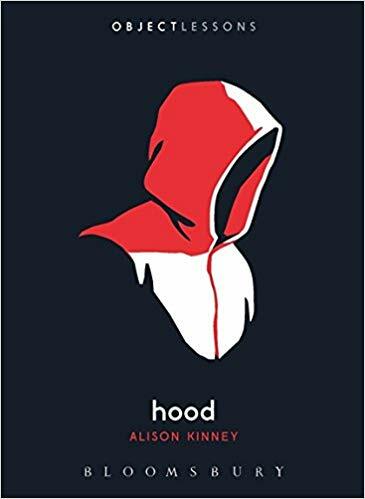 This last – the hoodie – was, for me, the most obvious application of ‘hood’ and the one I was most expecting (to what extent this was suggested by the cover, I can’t say), and none of these focal points surprised me. I was a little surprised to learn that the executioner and the torturer did not wear hoods til pretty modern times – our attribution of the hood to the medieval bad guys is a modern error (or, perhaps, a calculated strategy). But I was more surprised that Kinney’s hood is so consistently an image of violence. She mentions the hoods worn by professors, judges, and academics – the honorable hood – but only as a point of contrast. In the opening pages, Kinney lists the hood’s uses: by “judges, athletes, rappers, torturers, politicians, and toddlers… to attend school, commute… go to war or protests, take a hike, walk the dog, ride the Maid of the Mist, or visit our grannies in the woods… coaches, firefighters, fishers, boxers, beekeepers, and Mark Zuckerberg… skaters, cosplayers, fetishests, presidents, and the entire Knowles-Carter family.” She apologizes: “Sorry, but you’ll have to wait for the sequel to get car hoods, stove hoods, and Mount Hood.” This promise of exhaustivity is not carried through, however. I recall Sock, wherein Kim Adrian reached back to the origins – the invention of the sock. That part of the hood’s story is missing here. I guess Sock and Souvenir had conditioned me to expect a really broad, start-to-finish, far-reaching treatment, and that’s not what Hood does. Hood focuses on injustice, violence, death, and abuses of power. It’s an important story; I’m not necessarily against Kinney’s approach, but it’s not what I’d been expecting. The other way in which this book differs from the others I’ve read is that Kinney, as narrator, as researcher, and as holder of opinions, was lacking from her narrative. It has long been a reading preference of mine to find the author in her work; in nonfiction, I find it essentially dishonest to act like an impartial observer or researcher, because there’s no such thing. In this book, in particular, because Kinney takes decided political stances on a variety of issues, I really felt the hole left by her absence. Let it be said that I agree with her politics. But I regret that she didn’t reveal something of herself in stating them. I think it would have strengthened the book. I’m interested to learn that the Object Lessons series takes more varied forms than those I’ve already encountered. I think I prefer the other model: the exhaustive, whimsical, present-narrator one. But Hood has much to offer, including a strong indictment of capital punishment, a chilling glimpse into Abu Ghraib, and a discussion of the black bloc of protesters at the Seattle WTO meeting and beyond.